This recipe is a nice introduction to Moroccan style spices like cumin, cinnamon and coriander. Use a little dash of red pepper for young eaters, or kick it up more for those who like spicy. The original recipe idea came from Cooking Light. It was written as a lamb recipe. Ground lamb is sometimes hard to find, and can be expensive. Turkey works well here as a substitute and is more universally appealing. Chickpeas add extra fiber and protein. When served over the couscous and arugula it is truly a complete meal. We served this the other night with a little bit of fresh fruit. 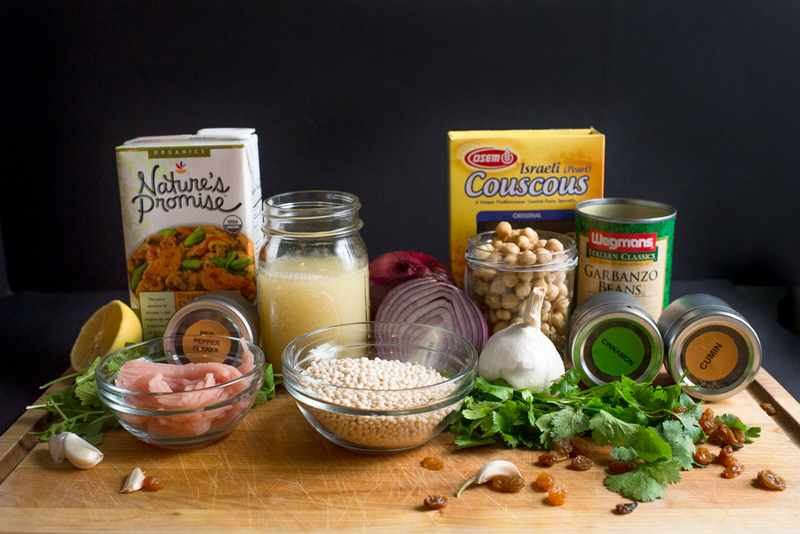 Give your kiddos a stamp in their Food Passport for trying this Moroccan style meal!! In a small pot boil 1 cup of water. Add couscous and ¼ tsp. salt, put lid on and turn heat off. Allow couscous to steam for at least 10 minutes. While couscous is steaming, brown turkey in skillet, about 6 minutes until cooked through. Discard drippings and set turkey aside in a separate bowl. Heat olive oil in the skillet and cook onion, carrots, and garlic on medium heat until softened, about 4 minutes. Add cumin, cinnamon, coriander and red pepper and stir for 30 seconds to allow flavors to develop. Add the browned turkey and chicken broth followed by raisins, tomato paste, lemon zest, and chick peas. Allow mixture to come to a boil and then thicken on a simmer over about 4 minutes while stirring occasionally. Remove lid from couscous and fluff with a fork, stirring in one teaspoon of lemon juice. Stir in the remaining one teaspoon of lemon juice and the cilantro into the turkey. Season turkey to taste with salt and pepper. When the couscous is slightly cooled, stir in arugula into the couscous. 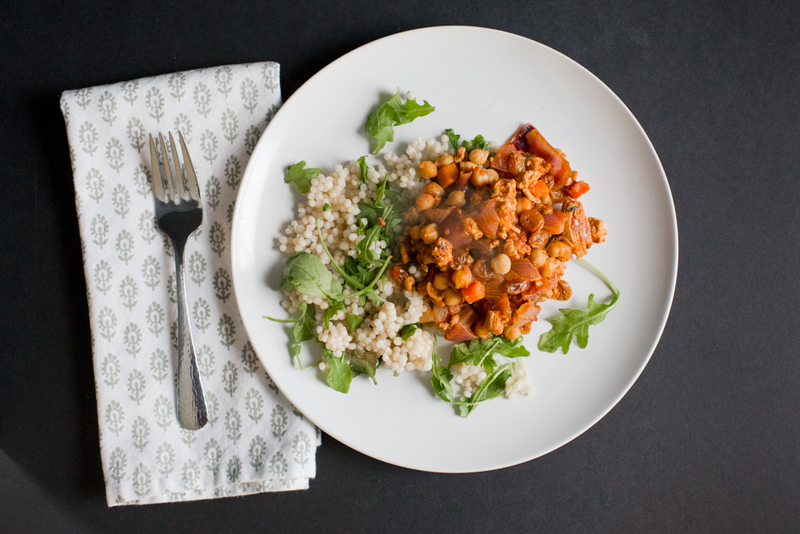 Spoon turkey mixture over a bed of couscous and arugula and serve warm.